Rakhi is just around the corner, August 2nd is fast approaching. Tajonline.com is out to make this Raksha Bandhan even bigger and better than ever before. So we present to you our extravaganza offer!! Now no matter what you buy, you get a free gift! 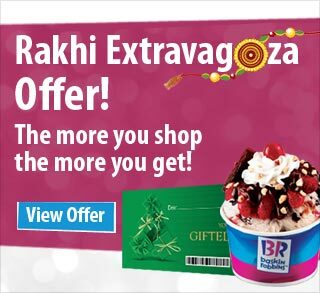 So place an order worth Rs.1000/- or more and get a Baskin Robbins voucher worth Rs.200/- FREE. OR place an order for Rs.2500/- and above and get Rs.500/- worth of Lifestyle vouchers absolutely FREE! So, now that you’ve seen our amazing offer what are you waiting for? Again, this is a very limited period offer, so hurry and avail of it while it lasts.Just remember, these free gifts will be delivered to your recipient. ← Gifting and beyond this Rakhi!